Samantha Larsen (left) and her big, Kate Fisher (right). My name is Samantha Larsen. Coming from out of state, I didn’t have many friends at LSU, but I knew after opening my bid to Zeta Tau Alpha it wouldn’t be long before I had 300+ lovely ladies to call my friends/sisters. Going through rush I had my heart set on getting a big sister. I’m an only child, so it’s always been a dream of mine to have a big sister. Thankfully, I hit the jackpot. 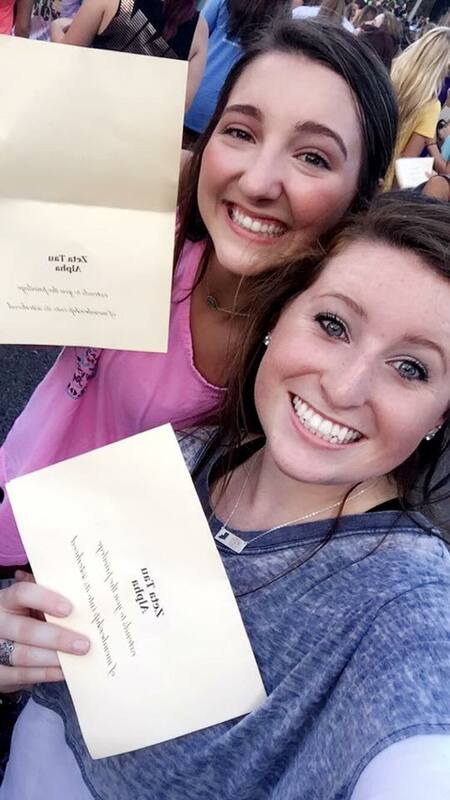 Samantha Larsen (top) and Brooke Renton (bottom) receiving their bids! It’s bid day on West Lakeshore Dr. - otherwise known as the Sorority Row at LSU. I was an out-of-state incoming freshman that just finished a weeklong rush unlike anything else I have experienced. Now it’s time to run down to the second most important white house in the world, and I was on the hunt for the perfect Big Sis. After running down the row, I was greeted with a slew of screaming, excited new sisters. I’m determined to meet as many Zetas as possible to find the perfect big sister. Little did I know, she had already found me. Zeta has a great program to help you meet new members and get to know them for a week. “Bunny Buddies” are a weeklong buddy system for about four weeks so prospective Bigs and Littles can hang out. I was overly excited to get my first Bunny Buddy because by my second week of college, I was dying for a Big Sis to help me navigate around Baton Rouge to find the best pizza. Patiently waiting in the Zeta house, it was finally time. I turn around to find this curly-headed, perfection of a human. She quickly hugged me and yelled her name, “Kate Fisher.” Kate not Katie, Fisher. At that moment, I knew I was going to have my hands full. We spent the rest of the night tracing around Walmart trying to find Mascara and dairy-free cheese. (Yes, my big is lactose intolerant, and no I didn’t know this at the time; ordering at restaurants is always an adventure.) Since that day, and for the rest of my freshman year, I don’t think we spent more than a few hours apart. Kate is everything I hoped to find in a big. Every morning before I have a test, I get a good luck text, and it’s just a reminder she always has my back. No matter what I go through, I know she will always be there to help me through it and put her two cents in. We are almost at a year now, and we have been through so much together. We’ve done everything - football season, formal (where Kate tripped and tried to break her ankle), spring break, every Tuesday night baseball game at The Box and so much more. Currently, we are Facetiming three times a day while she is in Cap Code for an internship for the summer. I know it’s cliché to say, but ever since the day I opened my bid card that read Zeta Tau Alpha and ran home to that big beautiful white house, my life has truly changed for the better. A large part of this is due to my big sister. I know that it doesn’t matter where I go in life because she will be right by my side to help me through it. I hope every girl up and down the rows of every college campus gets to feel the way I do when I walk into 4010 W Lakeshore Dr. I believe the roll of a big sister is to help and guide a little sister through college and sorority life and continue being in her corner throughout life. I’m not sure if Kate took a prep class (because that is a very “Kate” thing to do) or if she was just meant to be a big sis, but Kate Fisher went above and beyond to help me find my place in college, Zeta, and the adult world. I can only hope that I can give all the love and support back to Kate that she has so graciously gifted to me. Tell me how two out of state, only children, sports-enthused, loud mouthed, One Tree Hill loving, perpetually late gals found each other like we did. Some say its fate when two people such as us become friends; however, I say it’s just the power of Zeta Tau Alpha. In preparation to become a big myself, I asked Kate how “Bunny Buddies” are assigned. She went on to inform me that prospective bigs can hand-pick girls. At that point, I became very confused; how could Kate have picked me a year ago wehn we were complete strangers and didn’t talk during recruitment? 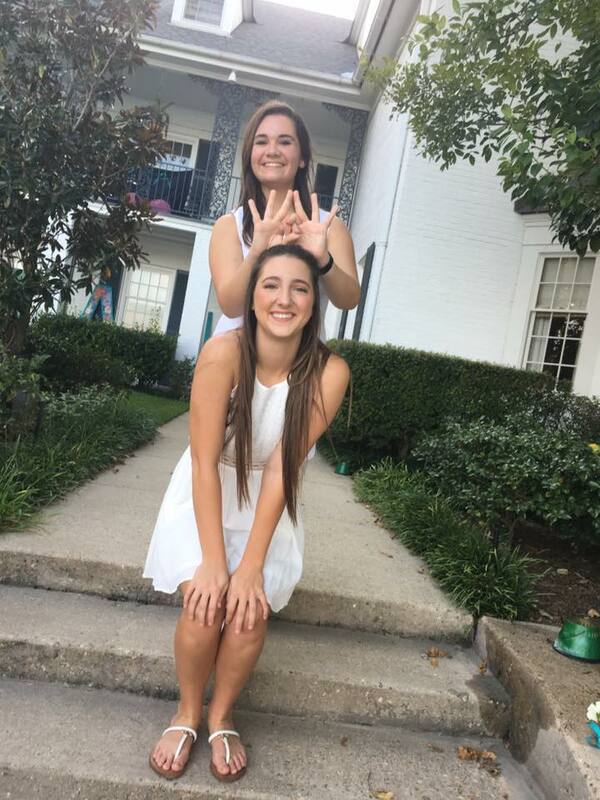 She told me, “I saw you dancing around on bid day looking like you were having the time of your life and thought to myself ‘hmmm, any girl that spastic of a dancer, who hasn’t stopped talking for 40 minutes, would be perfect as my little.’” Kate asked to have me as a Bunny Buddy, and the rest is history. She found her perfect Little and I have certainly found my perfect Big - my sister for life along with 300+ others. A lot of times I no longer feel like I am a part of Zeta but rather Zeta is a part of me.